Toni's husband died during a military assignment, so to make things easier to cope with, she moves to a town closer to her mother, with her daughter, Evie. She get a part time job and hopes that things will finally turn around for her and Evie. Things start to go awry as she starts to get dates and times wrong, a feeling of being watched. The more paranoid she gets, the more she keeps popping these sedatives that she has. It's just to calm her down so she can focus, right? It's ok that Evie sometimes can't wake her up. Soon everything will be all better... she just needs to get through each day. But then Evie ends up missing on a day she's late picking her up from school... and it's all her fault.. isn't it? Bookouture is throwing out some amazing thrillers! This one is told mainly through Toni's eyes but bounces back and forth with short stints through Evie and other character's eyes as the book progresses. The author truly made me hate some of these characters. I swear I have a new frown line on my forehead after reading this book! I do love to hate on some characters though. 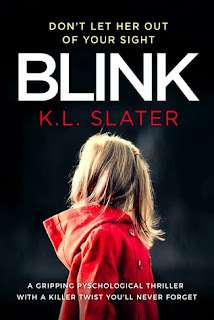 And to take something as simple as a mother's negligence to create an atmosphere of doom... *shiver*... you will definitely feel the twists in this one - I had to do a double take at one point because something I thought turned out to NOT be - way to go Slater, way..to..go! I am most definitely going to continue reading her work and am adding her first thriller to my TBR now. Huge thanks to Bookouture, NetGalley and K.L. Slater for an advanced copy in exchange for my honest review.